JPA is a Java EE standard O/R(Object-relational) mapping framework for mapping the POJO(Plain old Java object) and relational database and has been considered as a technology that works well with Domain-driven design. Traditionally the data-oriented approach involves with ER models, so when you use JPA, you would probably use tools like Dali Java Persistence Tools of Eclipse WTP's or Hibernate Tools of JBoss Tools to generate Entity classes by reversing the physical DB scheme. However I find that those reversed classes are less flexible as they are tied with restrictions of its related models such as the expressions in many-to-many relationships..etc. On the other hand, UML is often used in the Domain-driven design practice for designing domain models. 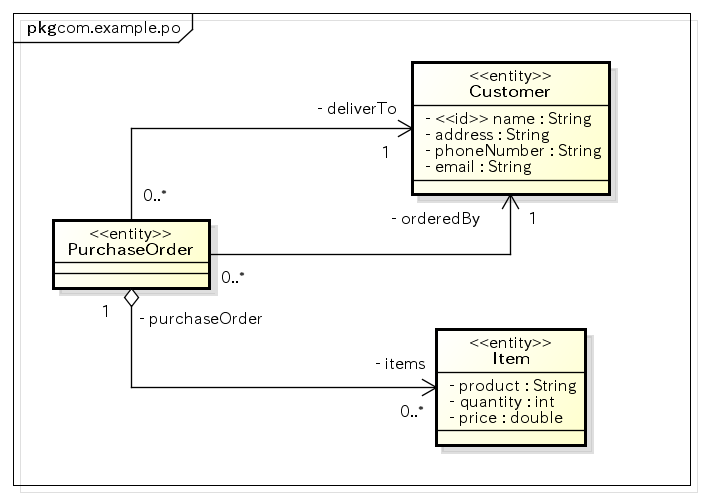 Using JPA entity models whose expressions are closer to UML, makes it easier to maintain the implementations of domains close as the original Entity models. In this way, you can also add annotations to Entity classes and customize DDL which JPA generates for mapping physical DB scheme in detailed level. In this tutorial, I'd like to introduce my approach to generate initial JPA Entity Classes from UML model to develop them. In this tutorial, I will use Astah Professional for creating UML diagram and any<code/> for code generation. Astah Professional is a software design tool which supports UML 2.x diagrams and ER Diagram by Change Vision and any<code/> is a plug-in developed by Jose Carreno to generate various programming languages like Java, JPA, PHP, C#, Objective-C..etc from UML Class diagrams using templates. Let's use this sample purchase order system model as an example. PurchaseOrder is related to the Customer with "orderedBy" and "deliverTo"
To generate source code using any<code/>, you need to create template files first and this is the most important step in this tutorial. Create these two template files and save them in a new folder. In the "JPA-ENTITY-content.mda" file, we specify to generate code of classes only if they have "entity" stereotypes. By specifying this condition, you can model JPA classes and other classes all together in one same project without worrying about generating unnecessary codes..etc. By using the Groovy findAll() which takes closure, it can loop the persistent classes and relationships to the JPA Entities. Navigable or unspecified-navigability associations will be included in attributes, so that annotations will be added accordingly and automatically by default. In this sample model, "PurchaseOrder" owns "Item", so the appropriate "mappedBy" option will be included in the generated source code. Since I used simple default methods for exporting fields, getters and setters such as the jpa.attribute()...etc, the exported code is very simple (You can see the source code at the end of this tutorial). However there are abundant ways you can do with this any<code/>, for example when a property is added to an association, you can make the the other side of association to update with this change automatically by creating a template to do so. Hope this tutorial helps you understand how you can generate initial JPA Entity classes code from UML models to develop with. To see what more you can do with this any<code/> such as JPA directives, how to create Repository Interface for Spring Data.. etc, please refer to the any<code/> website and tutorials. At last, we'd like to send a big thank-you to Mr. Jose Carreno for creating such significant plug-in. Download Astah for free and try go through this tutorial by yourself. ​Change VIsion, Inc. ALL RIGHTS RESERVED.